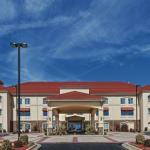 Free breakfast free Wi-Fi and a heated indoor pool make La Quinta Inn & Suites Searcy a solid choice for our guests. This three-story hotel has 71 rooms â?? some non-smoking â?? with 32-inch flat-panel cable TVs with HBO free Wi-Fi and coffeemakers. Some rooms have microwaves. A free breakfast starts the day and a visit to the fitness center or heated indoor pool and hot tub can keep that momentum going. Meeting space is available. Parking is free and pets are welcome. La Quinta Suites is less than one mile to Hallwood Petroleum two-and-a-half miles to Land O'Frost and 11 miles to Chesapeake Energy. Twelve miles from the hotel is Little Red River where you can enjoy nature trails boating fishing and more. Bill and Hillary Clinton National Airport is 52 miles away.